Toast has been trending hard for some time, particularly the notorious avocado version. The combination of creamy avocado, crunchy bread, a little lime juice, and sea salt never seems to get old. If you are in need of a little update to your toast game, then you are in luck. 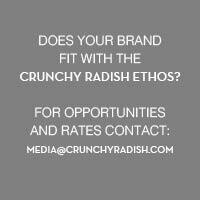 Today is the launch of a new series your new avocado toast, where Crunchy Radish will feature nutritious alternatives to up your toast game. A piece or two of toast has a perfectly happy place in a clean and a health-focused diet as long as you opt for good quality whole grain bread or a gluten-free counterpart. To help create some alternatives to the now somewhat basic, but always a favorite, avocado toast, I called upon my bi-coastal bestie, Danielle Lipson, to create some delicious and nutritious alternatives. Up first - bloody berry toast. Before you click unsubscribe, don't you fret vegheads, it's vegan and cruelty-free! My eyes have always been bigger than my stomach. My mother loves to remind me of trips to the grocery store when I'd insist on the purchase of some sort of treat only to get home, have a few bites, and forget all about it. While I hate to admit it, as an adult some of my weekly trips to the farmer's market are reminiscent of those days shopping with mom. Luckily, these days my excitement lies with the fresh produce rather than the pre-packaged cookies of my youth. When a fruit or veggie comes into season and I just have to have it, I waste no time hustling it into my basket. As it is, life gets in the way and sometimes those once ripe, bright berries start looking a bit sad. But now I don't stare at the sad berries and allow them to grow more and more morose by the day, I take those remaining berries, cut 'em up, toss them in a saucepan and, within minutes, I have a delicious topping for toast. This toast is great anytime of day - for breakfast, an afternoon snack, or even for dessert. 16 oz extra soft strawberries - (fresh ones do the trick too). Leaves removed and sliced in half. Vegan almond ricotta, we like kite-hill, or make your own. Combine the blood orange zest and juice, strawberries, and cinnamon in a small sauce pan. Cover and heat over medium-high heat until berries have softened considerably, about 4-5 minutes. Uncover and cook on high, stirring continuously for about a minute to reduce. Remove from heat and set aside. Toast your bread and generously spread the almond ricotta across one side of each slice of bread. Drizzle honey over the "cheese", and top with berry mixture. Enjoy remaining compote with yogurt or more toast.